About this object John Bell of Tennessee served 7 terms in the House before winning election to the Senate in 1847. On this date, John Bell, the 12th Speaker of the House was born near Nashville, Tennessee. Before his congressional career in the House and Senate, he worked as a lawyer and briefly served in the Tennessee state senate. 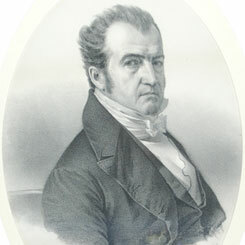 In 1827, Bell began the first of seven terms in the House of Representatives. Initially elected as a Jacksonian, he later switched affiliations and joined the Whig Party. During his House tenure, he chaired the Committee on Indian Affairs and the Committee on the Judiciary. Elected Speaker of the House for the 23rd Congress (1833–1835), Bell defeated fellow Tennessee Congressman and future President James K. Polk for the coveted leadership position. In the subsequent Congress, Polk beat out Bell for the speakership. Bell chose not to seek re-election to the 27th Congress (1841–1843) and instead accepted a place on President William Henry Harrison’s cabinet as Secretary of War; he resigned a few months after the death of Harrison in 1841 when President John Tyler refused to embrace a Whig agenda. Bell returned to Congress when he won election to the Senate; he served two terms from 1847 to 1859 as a member of three political parties: Whig, Opposition, and Know-Nothing. In 1860, the former Speaker made an unsuccessful run for President on the Constitutional Union Party ticket. Bell died on September 10, 1869, at his Tennessee home on the banks of the Cumberland River. “I always found him to be a man of decided talent, a patriot and lover of his country,” fellow Tennessean and former President Andrew Johnson eulogized.